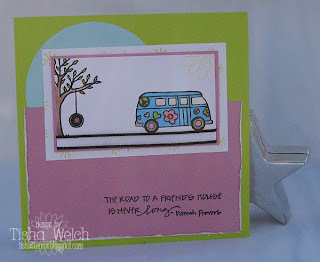 bitter sweet stamping: More fun cards! This card was made for a very, very special woman for her birthday ... of course, I screwed around with it, then ended up casing myself, then wasn't sure if it was good enough ... now it is embarrassingly late, but oh well, what are you going to do?? She'll forgive me! All stamps, paper and ribbon by A Muse! This cutie is also for a very special chickie who recently suffered a loss! I was trying for the so sorry, yet upbeat card! 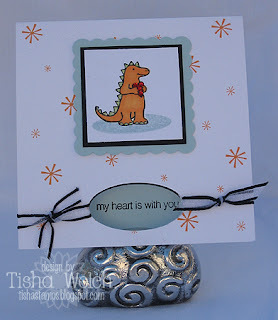 The dino's little heart is covered with A Muse twinkle stickers! Bling, bling! The sentiment is from SU (a retired set called something sayings), ribbon by A Muse, punches by SU and Marvy. these cards are sooo stinkin cute! !